I have lost 5st 8lbs78lbs35.5kg with NC, although I've lost a total of 6st 8lbs92lbs42kg since May 2016 as I did not start logging and keeping my diary again until I was down to 17st 4lbs242lbs110kg which was on June 2. I hit target weight on 29 April, so it has been eleven months of focused weight loss. In February 2016, I had various falls, one of which led me to develop cellulitis, which is a sub-cutaneous skin infection, not to be confused with cellulite, or dimpled flesh! I was on antibiotics for weeks, and because I'd hurt knees and twisted an ankle, not able to exercise. I'd been steadily packing on weight for three years before that, but between Feb and May 2016, I packed on over a stone in four months. By May, I was experiencing joint pain, plantar fasciitis and shortness of breath, and I felt frightened about how out of control I'd let my health get. I knew from previous experiences with NC that logging calories and exercise was a sure fire way to lose weight, and I also read Michael Moseley's Blood Sugar Diet. I decided to make a commitment, first to a week of eating more healthily, then a fortnight, then four weeks and then eight weeks. I felt that I could make that commitment and see how I felt, how the weight was moving. I first joined NC years ago, and lost 3st 5lbs47lbs21.3kg, but didn't manage to get to target weight. I kept falling off the wagon when it came to logging, managing a balanced approach to my food and succumbing to emotional eating. I've always been a yo-yo dieter. 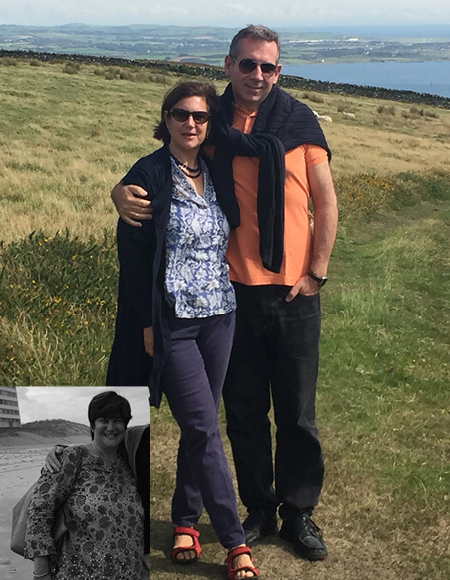 I did my first diet with my Mum in 1981, the Scarsdale diet and lost 2st28lbs12.7kg, going from 13st lllbs193lbs87.5kg Through my 20s I was always careful with diet and exercise, but after marriage and children, during my 30s, I found it very hard to resist all the classic mistakes, like finishing off the boys' chips or cake and making plenty of comfort food. I am much more confident, love fitting back into clothes I haven't worn for decades! This time, I found it very straightforward. I've always cooked plenty of vegetables, and because I'd decided to commit to this during the summer, it was easy to eat fruit, salad and cut down on processed starches and anything with added sugar. I was able to embed exercise back into my life, as I healed from the falls I'd had and I began to have much more energy and enthusiasm. There were times when I felt lazy about exercising. But my much more careful way of eating has really embedded itself. If I eat too much now, I feel bloated and I don't enjoy that at all. But there are times when it is hard to get out of bed and do the exercises. I have a Tomtom sports watch and run regularly using the Nike running app and those keep me very motivated now. Planning meals carefully has been key to this. I sit down on a Thursday, work out my routine, my cooking and shopping and get sorted on a Friday evening so that my weekends are free for exercise, activity and enjoying family time. I feel so much better. I am much more confident, love fitting back into clothes I haven't worn for decades, literally and really get a lot out of running, keeping fit and enjoying a much more lively range of cooking. I love experimenting with flavours and spices, and enjoy my food very much. Just this week, I ran 10k for the first time in 5 years. I am now aiming to embed that into my routine so that I run three times a week, two 5K runs and one 8-10k run regularly. Short-term goals are easier to commit to. Work on a week by week or a monthly basis and set clear targets. I used a great little app with 5kg targets which really cheered me up even through the plateaus. Plateaus are a big part of this. If you hit one, try a little intermittent fasting and up the exercise. Never beat yourself up for a lapse here and there. Put it behind you and recommit to a healthier way of eating for a day, then a week and build up your achievement day by day.